Called together in the Sudan by Hassan al-Turabi, the 1991 Popular Arab and Islamic Congress Conference sought to unify Mujahideen and other Muslim elements in the wake of the Soviet withdrawal from Afghanistan and Iraqi loss in the Gulf War. 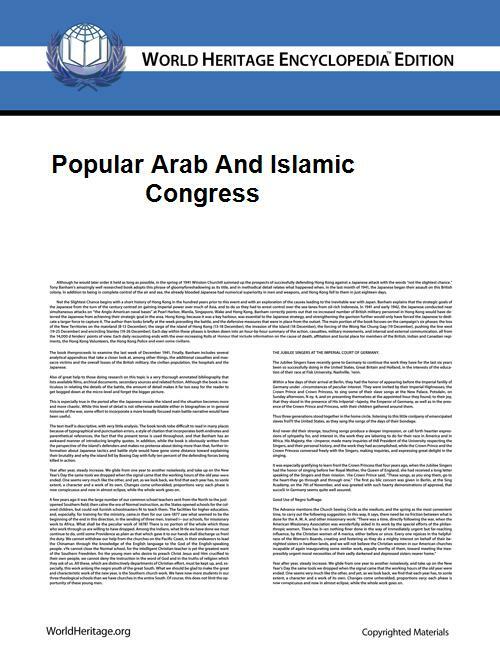 Held from April 25–28, it brought together disparate sections of the Islamic world in an attempt at Pan-Arabism and Pan-Islamic union. It was estimated to have brought together 500 people, from 45 nations. It has been suggested that al-Turabi hoped to "crystallize discontent in the Arab world by bringing together under a single banner, hardline Islamic militants and nationalists". Mounir Shafiq, General Director of the PLO Planning Center. ^ a b c d e f g h i j k l m n o p q r s t u v w x y z aa ab ac Burr, J. Millard. "The Terrorists' International". Table 1. p.88.